Strange Culture: Tilda Swinton and Thomas Jay Ryan as Steve Kurtz. In Strange Culture, which was released on DVD this past March 25, filmmaker Lynn Hershman-Leeson tackles the bizarre case of Steve Kurtz, an associate professor of art at SUNY/Buffalo and founding member of the award-winning art and theater collective Critical Art Ensemble, whose interactive projects include the examination of biotechnology and the issues surrounding it. Kurtz's life suffered an upheaval of Kafkaesque proportions following the unexpected death of his wife, Hope, of heart failure in May 2004. In a matter of days, Kurtz went from professor-artist-activist to bioterrorism suspect – as per the FBI and the US Department of Justice. It all began when those answering Kurtz's 911 call saw the Bio Art materials he was using in an upcoming exhibit about genetically modified (GM) agriculture for the Massachusetts Museum of Contemporary Art. The exhibit would have allowed museum visitors to test food products for the presence of GM ingredients. To the police, that type of artwork looked like the stuff “bioweapons” are made from. The FBI was informed, and the result was the bioterrorism accusation. Kurtz is still awaiting trial for the possession of biological materials that just happen to be freely available online. In Strange Culture, which premiered at the 2007 Sundance Film Festival, Hershman-Leeson approaches Kurtz's difficult subject matter by interpolating reenactments (partly as a means to sidestep legal restrictions on Kurtz) with artworks, interviews, and even discussions between the actors and Kurtz himself. In the reenactments, Thomas Jay Ryan plays Kurtz and this year's best supporting actress Academy Award-winner Tilda Swinton plays his wife. Lynn Hershman-Leeson, Steve Kurtz, and Lucia Sommer, coordinator of the Critical Art Ensemble Defense Fund for Kurtz, have agreed to answer a few questions about both Strange Culture, which was recently screened at the Ann Arbor Film Festival, and the culture of oppressive paranoia in which we live. The q&a below was divided into three parts, one for each interviewee. I'd also like to thank Lucia Sommer for clarifying a couple of issues that have been misreported in the various film reviews. More information on Strange Culture at the film's official site. May 2, 2008 update: After four years, a U.S. federal judge has finally dismissed all charges against Kurtz. At Inter Press Agency, William Fisher has written a thorough article on the absurdity of the case. “The then governor of New York, George Pataki, lauded the work of the FBI for disrupting a major bioterrorism threat. And the then U.S. attorney in Buffalo, Michael A. Battle – the lawyer who was later to become the Department of Justice employee who notified eight U.S. attorneys that they were being fired – praised the work of the Buffalo Joint Terrorism Task Force. “But after a several-month-long investigation, the FBI and the Department of Homeland Security (DHS) failed to provide any evidence of 'bioterrorism.' On the contrary, FBI tests revealed within a few days of the incident that there were no harmful biological agents in Kurtz's house and that his wife had died of heart failure. How did you hear of Steve Kurtz, and what made you decide to make a documentary about his case? Someone who was a friend of the “yes men” told me immediately as it was happening. I wanted to help and thought a DVD that could inform people about the particulars of the piece was the best way I could help. Was it difficult to find funding for a documentary about such a controversial subject matter? Yes, but there was very little funding. I used my own camera [and] money. A few others joined, and mostly people volunteered. We did not do it for money; it was a different kind of film. Strange Culture is a documentary, but you also use actors for reenacting scenes – Thomas Jay Ryan plays Steve Kurtz; Tilda Swinton plays his wife, Hope. Why that choice? Were you at all concerned that such an approach might blur the line between fact and fiction? Because I knew them; because Steve asked that Tilda play Hope. We needed actors to reinterpret events, to open out the edges of the film, just like Steve's life was opening to interpretation. In his Variety review, John Anderson states that “the unavoidable implication [of Strange Culture] is that Kurtz, as an artist and critic, was inconvenient to the food industry and an obvious target for paranoia-happy feds.” Was that the intent of Strange Culture – to show that Kurtz's arrest and subsequent bioterrorism charges were related to other forces at work besides government paranoia? Yes, I wanted all aspects to be part of the dialogue. Steve Kurtz is still on trial. Has Strange Culture had any sort of effect on his case? Did Kurtz himself have anything to say about it? We all think the film did amazing things, both to help raise awareness, raise money for his defense, and embarrass people hopeful of a conviction. Do you have any new project in the works? Always. A vampire project and also a film on the history of feminist art that I've been shooting for 40 years. It needs to be finished this year. Steven Kurtz and participant in Critical Art Ensemble's science-theater project GenTerra, London Museum of Natural History, 2003. The project examined issues surrounding the creation of genetically modified organisms (GMOs) and biological environmental resource management. GenTerra was among the artworks seized in the FBI's 2004 raid on Kurtz's home. How did you become involved in the Steve Kurtz case? I'm a friend of Steve and Hope Kurtz since 1994. I was among the group of friends, colleagues, and neighbors of Steve and Critical Art Ensemble who came together in 2004 after Steve's arrest, to support him and raise money for his legal defense. Currently I coordinate the CAE Defense Fund. What has the Critical Art Ensemble Defense Fund accomplished thus far in regard to Kurtz's case? Without the efforts of thousands of people who raised the money to pay the legal bills and created the media surrounding this case, Steve would quite literally be in jail today awaiting trial. The government has unlimited resources to bring and prosecute these kind of charges, but the accused do not have unlimited resources to defend themselves. Without the kind of media spotlight we were able to create, the DoJ could easily have continued to argue that Steve was a national security threat, imposed an enormous bail, and held Steve until trial. In most of these cases of people being accused of “terrorism” (and especially at that time) the mainstream media buy the FBI's story hook, line, and sinker, and few questions are asked. Immediately after Steve's arrest, he WAS a “bioterrorist” in most of the local and even the national media. MSNBC's Keith Olberman was one of the few who immediately saw through the hype. Fortunately, we were able to assemble a very good committee with impressive contacts and media skills. Once we began sending out press releases letting the world know what was really going on, the press very quickly did a 180 degree turn, and have been largely sympathetic ever since. Unfortunately, the majority of innocent people who are accused of being terrorists don't have the resources – either grassroots or institutional – to do this. On the material level, most good criminal lawyers don't work pro bono. So it's only been due to the efforts of people on four continents organizing fundraisers and benefits that we have been able to mount a vigorous defense. In the first year after his arrest, Steve was going from fundraiser to fundraiser just to pay the bills – he did over 30 in that year. The Paula Cooper Gallery auction in April 2005, in which a number of major artists donated work, really saved us and kept us going for quite a while. However, as we approach trial, we're again about $60,000 short of being able to pay the defense attorneys through trial. Should we all be concerned – that what happened to Steve Kurtz could happen to other activist artists (or non-artists) as well? 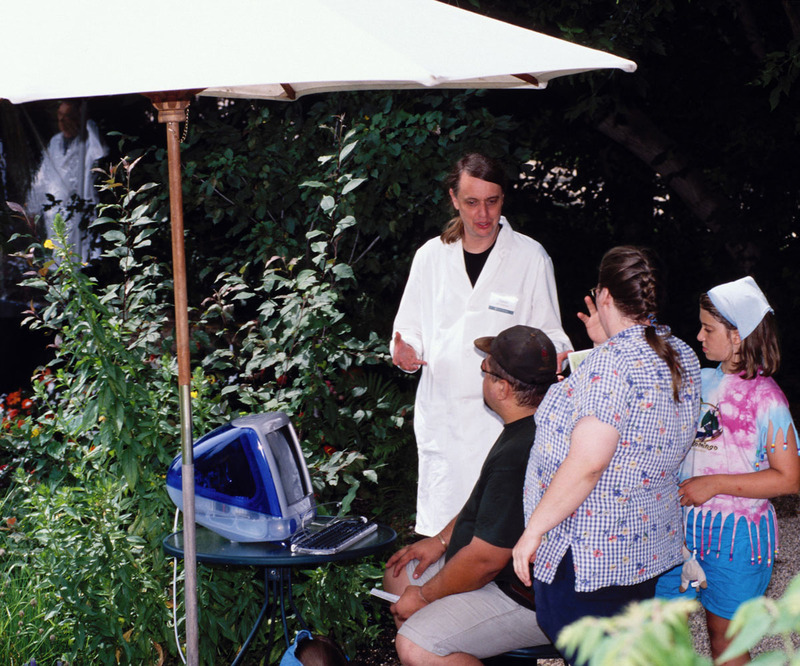 Steven Kurtz and participants in Critical Art Ensemble's science-theater project GenTerra, St. Norbert Art and Cultural Center, Winnipeg, 2001. How did you become involved in Lynn Hershman-Leeson's Strange Culture? She called and asked if I would be interested in working with her on a doc about the case. I knew her work. I liked it, and I needed all the media support I could get at that time. During production, what did you think of having a documentary made about your case – but with actors reenacting moments from your and your wife's lives? Were you at all concerned that such an approach might dilute the immediacy or the “sense of truth” of your story? I don't recall having any problem with it. I had seen American Splendor and knew the hybrid method could be valuable to a story like mine. Do you believe Strange Culture has made a difference in terms of how the public and the authorities perceive your case? In a previous post on Alt Film Guide in which I describe your experiences with the FBI and the Department of Justice, I wrote that “even Kafka couldn't have come up with something that bizarre.” How would you describe what's happened following your wife's unexpected death? On the surface, it does read as bizarre and senseless, but if one thinks about it, what happened to me makes perfect sense for too many reasons to list here. But just to give you a sample: The DoJ has taken on the sole role of the ideological police. Anyone who is not a a “good Bushy” must be in jail or feel the threat of jail over them. Some of the renegades that have to go are the activist community, academics, and artists – all known for their attachment to free speech. I fit in all of these communities – if examples must be made of the few in order to threaten the many, with me you kill three birds with one stone. I've posed this same question to Lucia Sommer. I'd like to get your point of view here: Should we all be concerned – that what has happened to you could happen to other activist artists (or non-artists) as well? [I would echo] what Lucia said.